ODYSSEY battery portable chargers are designed to fully and safely charge ODYSSEY batteries and other quality brands of 12-volt Absorbed Glass Mat (AGM) and flooded lead acid batteries. 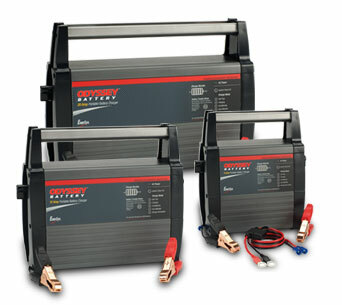 For professional shop users or enthusiasts doing a charger-to-battery match up, our professional grade design delivers performance, quality and speed in a rugged weatherproof housing. Stage1 - Unit self test: The charger checks connection and polarity, and determines if battery is good to proceed to Step 2. Stage2 - Analyzing: The charger determines if battery is capable of being charged. �System Check OK� indicator will illuminate green and proceed to Step 3. Stage3 - Charging: The �Charging� status indicator will be red. The charger will use all available charging amps until the battery voltage reaches 14.7 VDC. Stage4 - Conditioning: The �Conditioning� status indicator will be amber. The batteries will hold at 14.7 VDC for several hours to condition and fully charge the battery. Upon completion, the charger will go into Auto Maintain (Energy Saver Mode). Stage5 - Auto Maintain (Energy Saver Mode): The blue �Power� and green �Auto Maintain� LEDs will be on to indicate Stages 3 and 4 are completed. At this time, the charger will initiate Auto Maintain (Energy Saver Mode), to monitor and auto maintain the battery only when needed to maintain a full state of charge. Stage6 - Storage Recondition Mode: The green �Storage Recondition Mode� indicator will illuminate green with a slow fade in and out pulse to indicate that when in storage, the charger will automatically recondition the battery for up to three hours once a month to maximize battery power and performance and extend battery life.